Almond flour has a nutritional advantage over many processed flours in that it contains the same nutrient profile as whole almonds. 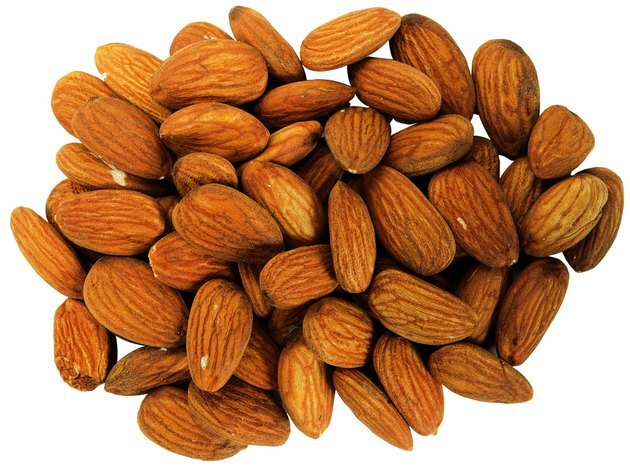 Whole or ground, almonds have more nutrients per serving than any other tree nut. The terms almond flour and meal are often used interchangeably. Almond meal is coarse and prepared from whole almonds with skins. Made from blanched almonds after the skin's been removed, almond flour has a finer texture. One quarter-cup serving of almond flour contains 138 calories, 5 grams of protein and 11 grams of fat. Of the 11 grams of fat, 7 grams are heart healthy monounsaturated fats, and less than 1 gram is saturated fat. Almond flour is naturally cholesterol free. A quarter-cup serving contains 6 grams of carbohydrates and is a good source of fiber, with 3 grams per serving. Almond flour is an excellent source of vitamin E, a powerful antioxidant that serves to protect cells against damaging free radicals and support immune function. A quarter cup of almond flour provides 40 percent of the recommended dietary allowance for vitamin E. Almond flour is also a good source of the B vitamins folate and niacin. Almond flour contains several key minerals for bone health, including calcium, phosphorus, potassium and zinc. One-quarter cup of almond flour provides nearly 7 percent of the recommended dietary allowance for calcium. Cup for cup, almond flour has almost as much calcium as milk. Almonds are also a good source of iron, providing approximately 14 percent of the recommended dietary allowance. Consuming a diet rich in monounsaturated fats, like those found in almond flour, can help lower cholesterol, reduce the risk of blood clots and lower blood pressure. The American Heart Association recognizes that whole and ground almonds meet total fat, cholesterol, sodium and vitamin requirements, qualifying them as heart-healthy food. Almonds and almond flour can display the AHA Heart-Check mark symbol on product packaging. Almond flour is an excellent grain-free baking option. Its protein and fat content makes it an ideal option for quick breads, muffins, cookies and bars. The protein, fat and fiber in almond flour will also contribute to satiety, the feeling of fullness between meals, which can assist with weight management. In many recipes, almond flour can replace wheat flour in a one-to-one ratio for seamless substitution. Store almond flour in the refrigerator to preserve freshness between uses.